Reason for despair: Climate change. It’s the perfect problem: more global, more long-term, more irreversible, and more uncertain that virtually any other public-policy problem facing us. Climate change is a lot worse than most of us realize. Almost regardless of what we do on the mitigation front, we are in for a whole lot of hurt. On the policy front, we have now talked for more than 20 years about how we need to turn this ship around “within a decade.” Not unlike the ever-elusive fusion technology, that hasn’t happened yet. Global carbon emissions declined slightly this year—for the first time ever without a global recession—but the trends are still pointing in the wrong direction. Worse, turning around emissions is only the very first step. It’s not enough to stabilize the flow of water going into the bathtub when the goal is to prevent the tub from overflowing. We need to turn around atmospheric concentrations of greenhouse gases. That means turning off the flow of water into the tub—getting net emissions to zero and below. It doesn’t help our efforts that many people seem to confuse the two. A study involving over 200 MIT graduate students faced with this same question revealed that even they confuse emissions and concentrations—water flowing into the tub and water levels there. If MIT graduate students can’t get this one right, what hope is there for the rest of us? Reason for hope: Climate change. Many signs point to some real momentum to finally tackle this momentous challenge. The Paris Climate Accord builds an important foundation. It enables transparency, accountability, and markets to help solve the problem. Many governments are moving forward with pricing carbon: from California to China, from Sweden to South Africa, we see ambitious action to reign in emissions in some 50 jurisdictions. Meanwhile, lots is happening on the clean-energy front. That’s particularly true for solar photovoltaic power, which has climbed up the learning curve—and down the cost curve—faster than most would have expected only five years ago. That has also provided an important jolt for sensible climate policy. Then there’s R&D for entirely new technologies. Bill Gates leading an investment coalition with $1 billion of his own money is only one important sign of movement in that direction. The excitement for self-driving, electric vehicles is palpable up and down Silicon Valley, to name just one potentially significant example. In the end, it’s precisely this mix of Silicon Valley, Wall Street, and, of course, Washington that will lead—and, in part, is already leading—to the necessary revolution in a number of important sectors, energy and transportation chief among them. Everyone is talking about 2 degrees Celsius. Why? What happens if the planet warms by 2 degrees Celsius? Martin L. Weitzman: Two degrees Celsius has turned into an iconic threshold of sorts, a political target, if you will. And for good reason. Many scientists have looked at so-called tipping points with huge potential changes to the climate system: methane being released from the frozen tundra at rapid rates, the Gulfstream shutting down and freezing over Northern Europe, the Amazon rainforest dying off. The short answer is we just don’t — can’t — know with 100 percent certainty when and how these tipping points will, in fact, occur. But there seems to be a lot of evidence that things can go horribly wrong once the planet crosses that 2 degree threshold. In “Climate Shock,” you write that we need to insure ourselves against climate change. What do you mean by that? Martin L. Weitzman: Coming back to your 2 degree question, it’s also important to note that the world has already warmed by around 0.85 degrees since before we started burning coal en masse. So that 2 degree threshold is getting closer and closer. Much too close for comfort. What do you see happening in Paris right now? What steps are countries taking to combat climate change? Gernot Wagner: There’s a lot happening — a lot of positive steps being taken. More than 150 countries, including most major emitters, have come to Paris with their plans of action. President Obama, for example, came with overall emissions reductions targets for the U.S. and more concretely, the Clean Power Plan, our nation’s first ever limit on greenhouse gases from the electricity sector. And earlier this year, Chinese President Xi Jinping announced a nation-wide cap on emissions from energy and key industrial sectors commencing in 2017. It’s equally clear, of course, that we won’t be solving climate change in Paris. The climate negotiations are all about building the right foundation for countries to act and put the right policies in place like the Chinese cap-and-trade system. How will reigning in greenhouse gases as much President Obama suggests affect our economy? After all, we’re so reliant on fossil fuels. Gernot Wagner: That’s what makes this problem such a tough one. There are costs. They are real. In some sense, if there weren’t any, we wouldn’t be talking about climate change to begin with. The problem would solve itself. So yes, the Clean Power Plan overall isn’t a free lunch. But the benefits of acting vastly outweigh the costs. That’s what’s important to keep in mind here. There are trade-offs, as there always are in life. But when the benefits of action vastly outweigh the costs, the answer is simple: act. And that’s precisely what Obama is doing here. And what steps should the countries in Paris this week take to combat climate change? 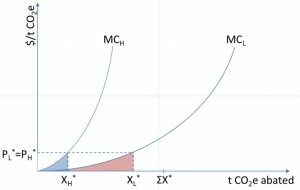 Martin L. Weitzman: If it were entirely up to me, I would have a very simple solution: negotiate one uniform price on carbon dioxide applicable to everyone. That doesn’t mean some imaginary world government would be in charge — not at all. Every country — every government — can implement their own policy, keep the revenue and decrease taxes elsewhere. But the price is universal across the world. Gernot Wagner: Pricing carbon, of course, is indeed the answer. It’s the obvious one or at least it should be. Now, the negotiations themselves, of course, are messy, and there currently is no negotiation around a uniform, globally applicable carbon price. Instead, what’s happening is many large countries — the U.S., the EU, and chief among them China — are putting forward internal policies that will put a price on carbon and other greenhouse gases. That’s also where Paris comes in: putting a framework on all these country actions. Gernot Wagner: I am. The climate problem is, in fact, a lot worse than many people realize. The climate shock is real. But there are solutions. They work. They are getting better and cheaper by the day. And we are largely moving in the right direction. Martin L. Weitzman: Climate change is an extremely difficult problem to solve, certainly among the most difficult I have seen in my lifetime. But I’m guardedly optimistic, yes. Gernot Wagner: In the end, it’ll take Washington, Wall Street and Silicon Valley to make this right by pricing carbon, deploying clean technologies at scale and investing in research and development that will lead to new, even cleaner technologies we can’t yet even imagine. A lot is happening on all these fronts. A lot more, of course, needs to be done. Originally published on the PBS NewsHour Making Sen$e blog, on December 3rd, 2015. Climate finance is lots of things to lots of people. For some, it’s the $100 billion “Copenhagen commitment”. For others, it’s Citi’s latest sustainable finance pledge of $100 billion. It’s Bill Gates’s $1 billion clean energy investment. It’s public and private monies; mitigation and adaptation; loans, bonds, equity stakes, high-risk ventures, Kyoto-style allowances, offset credits, and private and public grants. It’s all of the above. When it comes to carbon markets, climate finance is often about what happens with allowance revenue. That’s important. But the primary goal is, or ought to be, appropriately pricing the climate externality. 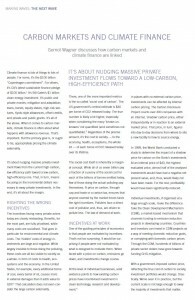 It’s about nudging massive private investment flows from the current high-carbon, low-efficiency path toward a low-carbon, high-efficiency one. That, in turn, means focusing on the incremental dollars necessary to sway private investments. In the end, it’s all about the margin. The incentives facing many private actors today are clearly misleading. Benefits, for the most part, are fully privatised, while many costs are socialised. That goes in particular for environmental and climate costs. The ‘hidden’ costs of energy investments are large and negative. While largely invisible to those doing the polluting, these costs are all too visible to society as a whole: in form of costs to health, ecosystems, and the economy. In the United States, for example, every additional tonne of coal, every barrel of oil, causes more in external damages than it adds value to GDP. That calculation does not even consider the large carbon externality. 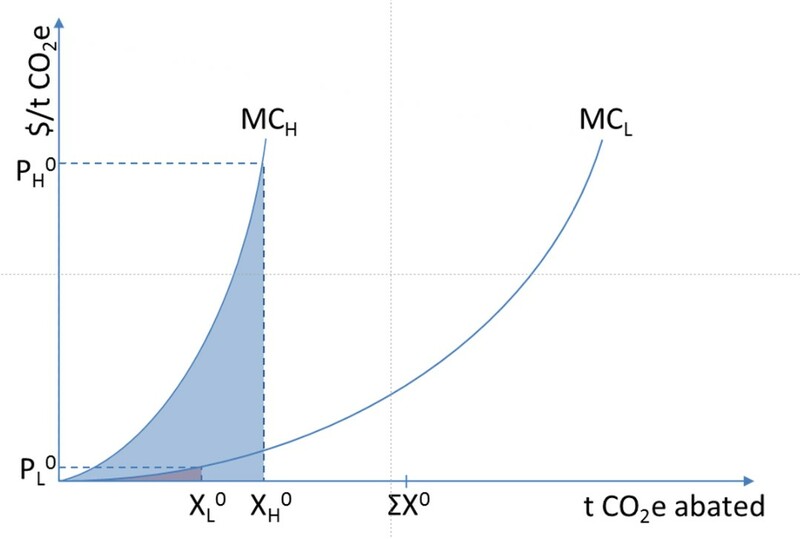 There, one of the more important metrics is the so-called ‘social cost of carbon’. The US government’s central estimate is $40 per tonne of CO2 released today. The true number is likely a lot higher, especially when considering the many ‘known unknowns’ not quantified (and sometimes not quantifiable). 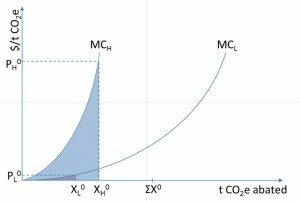 Regardless of the precise amount, it’s the cost to society — to the economy, health, ecosystems, the whole lot — of each tonne of CO2 released today over its lifetime. The social cost itself is inherently a marginal concept. While all of us seven billion pay a fraction of a penny of the social cost for each of the billions of tonnes emitted today, few of those doing the actual polluting pay themselves. A price on carbon, through cap and trade or a carbon tax, ensures that anyone covered by the market forces faces the right incentives. Polluters face a direct cost of pollution and, thus, are driven to pollute less. The law of demand at work. One of the guiding principles of economics is that people are motivated by incentives. That’s not too surprising. It would be surprising if people were not motivated by what is designed to motivate them. When faced with a price on carbon, emissions go down, and investments change course. At the level of individual businesses, solid evidence points to how existing carbon prices have incentivised investment in clean technology, research and development. 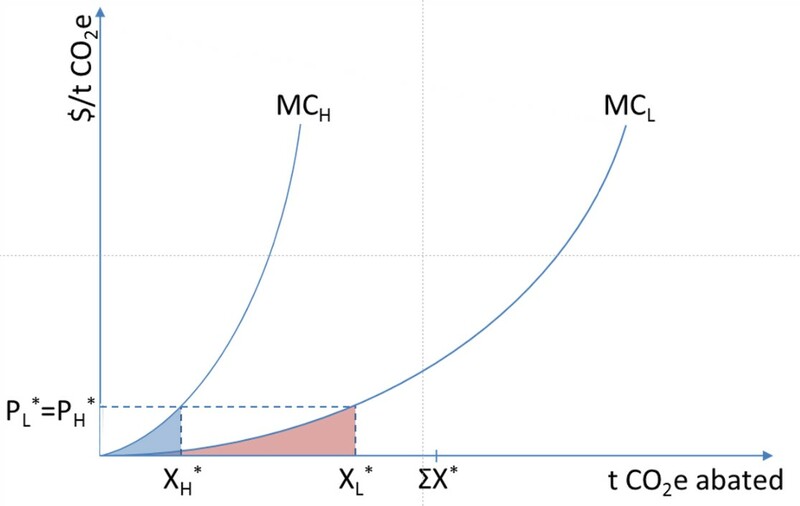 In places with no external carbon price, investments can be affected by internal carbon pricing. The Carbon Disclosure Project counts over 400 companies with an internal, ‘shadow’ carbon price, either independently or in reaction to an external market price. That price, in turn, figures into day-to-day decisions from where to site a new facility to how to source energy. In 1999, the World Bank conducted a study to determine the impact of a shadow price for carbon on the Bank’s investments. At an internal price of $40, the highest evaluated price, almost half of the analysed investments would have had a negative net present value, and, thus, would likely not have been made. For the rest, profitability would have been significantly reduced. Individual investments, if organised at a large enough scale, make the difference. Take the Clean Development Mechanism (CDM), a market-based mechanism that channels funding to emission reduction projects in developing countries. Countries and investors can invest in CDM projects as a way of meeting domestic reduction goals, or complying with domestic carbon prices. Through the CDM, hundreds of billions of private sector dollars have gone towards funding GHG mitigation. With a government-imposed carbon price, reflecting the true cost of carbon to society, investment portfolios would change. Drastically. We’ve seen it in practice, but the current scale is not large enough to sway the majority of investments that matter. Today, in fact, much of firms’ investments towards mitigating climate change are made voluntarily. Climate finance often is ‘concessional’ finance. That might be outright development aid. It also includes voluntary commitments like Citi’s $100 billion. Citi, of course, is not alone. Goldman Sachs committed $40 billion in 2012, Bank of America $50 billion in 2013, all made over 10 years. Meanwhile, these three banks alone underwrite hundreds of billions of loans every year. Total global Foreign Direct Investment is in the trillions. These massive financial flows won’t be redirected overnight. But they do follow incentives. In fact, that’s all they follow. Enter carbon markets. They ensure that anyone covered by the market faces the right incentives. The prevailing allowance price is one good proxy of the level of ambition of any particular market. It’s also what helps nudge investments into the right direction. In econ-speak, it’s all about internalising externalities. In English, it’s about paying your fair share and no longer socialising costs. None of that renders what’s traditionally called ‘climate finance’ unnecessary. There are still plenty of uses for additional monies. In particular, carbon markets are all about mitigation. Adaptation might dovetail nicely on some forms of mitigation, but it’s not the primary goal. That’s where foreign aid as well as government and private grants come in. If anything, those amounts need to be scaled up, too. But the true scaling happens on the investment front. That’s no longer “climate finance.” It’s simply “finance.” Re-channelling only 0.1% of total wealth under active management globally amounts to around a $100 billion shift. Efforts, of course, must not stop there. It’s about channelling the full $100 trillion into the right direction. Gernot Wagner is lead senior economist at the Environmental Defense Fund, and co-author, with Harvard’s Martin L. Weitzman, of Climate Shock (Princeton University Press, 2015). This article was first published in IETA’s Greenhouse Gas Market 2015 report “Making Waves“. Download the full text in PDF form. There’s nothing quite like biking down clogged city streets, weaving in and out of traffic. For short distances, it’s faster than driving. It’s liberating. It’s fun. It also makes it painfully clear that most roads aren’t made for bikes. Make one mistake, and you might end up dead. If you do everything right and the 4,000-pounder next to you makes a mistake, you still might end up dead. Few regular urban cyclists remain entirely unharmed throughout the years: A broken bone (“cut off by a van”), a scraped shin (“car door”), or perhaps simply drenched on an otherwise dry road (“I avoided the mud puddle; the car didn’t”). Blame it on my day job, but as I was cut off by yet another driver fixated on his phone while cycling to work, I got to thinking that this is how wind and solar electrons must feel as they try to navigate the electric grid. There, too, the infrastructure and rules were designed for the conventional, fossil fuel-based generators, not their smaller, greener counterparts. We need to get off gasoline-powered vehicles, the same way we need to get off fossil-powered electricity. Biking alone, of course, can’t eliminate fossil fuel-based transportation. It’s a niche alternative that chiefly works in densely populated cities filled with environmentally concerned citizens. What works in Berkeley, Boulder, Brooklyn and Boston won’t work everywhere. Neither can trains, by the way, another favorite of environmentalists. Most U.S. cities have a lot of catching up to do with their European counterparts, but, if anything, it will be electric vehicles that will truly help us make this transition. Similarly, wind and solar can’t singlehandedly eliminate fossil fuel-based electrical generation. They have great potential, much more so than biking ever will. But there, too, are limitations — chiefly the (eventual) need for storage to eliminate all fossil fuel-based generation: coal, petroleum and natural gas. Meanwhile, there are great benefits to pushing both green technologies. Biking helps get previously sedentary drivers to move, which, in turn, extends their lives and decreases societal health care costs, assuming injuries can be avoided by appropriate bike infrastructure. Every dollar invested in that infrastructure can pay for itself many times over. Something similar holds for subsidizing infrastructure for renewables (and, for that matter, some energy efficiency measures). The reduction in the large and risky global warming externality typically offsets the costs of subsidies and other sensible policy interventions. Many of the right policies are indeed being put in place. Still, some traditional utilities continue to fight the integration of rooftop solar and other renewables, the way New York City did with bikes in 1987 when it tried to ban them altogether from midtown Manhattan. Today, New York is decidedly friendlier to cyclists, with Mayor Michael Bloomberg adding over 300 miles of bike lanes to city streets, and a popular, still-expanding bike share program. Renewables, for their part, are increasingly welcomed onto the grid, with increased open access and grid management tools aimed at integrating intermittent renewable energy sources. Much more needs to be done. There’s one more parallel that might well dwarf all else: Biking for biking’s sake is fun on a sunny Sunday afternoon. On a Monday morning, when it’s about getting to a meeting on time and looking professional, transport choice comes down to getting there reliably, quickly, cheaply and without sweat stains. Electricity is no different. Solar panels may be an interesting, even fun, choice for some. The feeling of energy independence and doing good is a bonus. But many times, it doesn’t matter where electrons come from, just that they do — reliably, cheaply and cleanly. The ideal policy solution for energy is as clear as it is seemingly difficult to implement: Pay the full, appropriate price for electricity at the right time and place, including currently unpriced environmental costs. Once every electron comes with the appropriate price tag, the solar panel on your roof — or the solar farm down the road — may well carry the day. Or it might not. That’s OK, too. Having the right energy mix matters more than any one technology. The energy system is a system, after all. Biking, too, is but one form of getting around. Appropriate gas taxes, congestion charges and parking fees help incorporate the full costs of gasoline-powered engines and encourage more alternative modes of transport — from electric vehicles to public transport and bikes. Meanwhile, outright subsidizing those alternative modes is surely the right step. Pushing those alternatives at scale is as sensible as pushing renewables, especially when it also means moving closer to the ideal pricing policies in the first place. But pushing biking or any one form of alternative transport is no end goal in itself. At the end of the day, it’s about getting from A to B. That means — as it does for energy — getting the entire system right. Published on Ensia.com on October 1st, 2015. But the book is not about whether the climate is changing. It is. The book is about whether we are getting the order of magnitude of its effects right. Weitzman and I argue forcefully — in prose in the text, supported by a significant amount of research going into the 100-page end notes — that it’s what we don’t know that really puts the “shock” into Climate Shock. Lomborg asks how we can know that, if apparently we don’t. So we can very clearly cut off the distribution linking a doubling of pre-industrial concentrations to temperatures at zero. In fact, we can cut it off at least at around 1 degree Celsius (almost 2 degrees Fahrenheit). The world, after all, has already warmed by over 0.8 degrees Celsius (around 1.5 degrees Fahrenheit), and we haven’t yet increased pre-industrial concentrations by even 50 percent. Reprinted from Climate Shock, with permission from Princeton University Press. That skewedness of the underlying distribution is real. It’s important. The correct response, then, to those who are too sure about where the climate system will go isn’t to say, “cool it.” It’s to take the uncertainties seriously. Those, sadly, are skewed in one direction. Climate risk is not our friend. It ought to prompt us to rethink not just how we talk about climate change. It should also inform our response. The burden of proof clearly rests on those who argue against these statistical facts.